I recently upgraded my Mac to El Capitan. 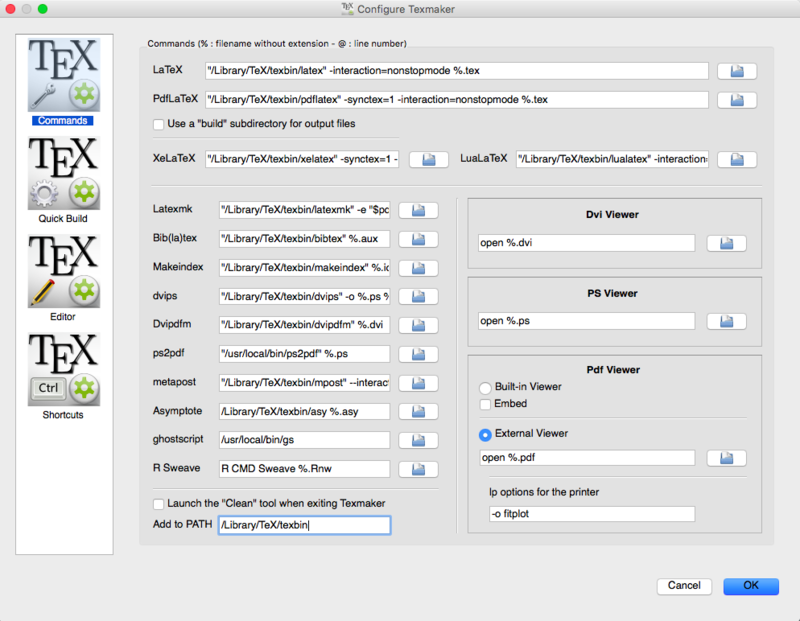 After installing the new Version of MacTex, I changed all appearances of /usr/texbin in the texmaker settings to /Library/TeX/texbin/. Normal tex seems to work just fine, but tikzpictures with tikzexternal don't. I added -shell-escape to the pdflatex command which worked fine before the upgrade to El Capitan. Now I get an error saying "sh: pdflatex: command not found" on the tikzpicture. When I copy & paste the command from texmaker to the console (and insert the filename) it compiles without any problems. ue now, I'll try to typeset the picture. The error message says there would be more information in weak-scaling.log which doesn't exist. I had a similar problem with texmaker on El Capitan yesterday which gave me a sh: repstopdf: command not found whenever I was trying to use a new eps graphic in my document. Apparently changing the specific paths to pdflatex etc. is not enough and it might still try looking for some binaries (when needed e.g. for converting images) in /usr/texbin. I found a solution here which suggests using the input field at the bottom of the command settings tab to add /Library/TeX/texbin/ to the PATH variable. After that everything worked fine for me. I'm a bit surprised that it doesn't find pdflatex in your case though because you have probably specifically set its path to /Library/TeX/texbin/pdflatex, but I hope that this still solves your problem. Note the active input box at the bottom which sets the PATH for the other binaries. Please read the information about MacTeX and El Capitan at http://www.tug.org/mactex/elcapitan.html and, especially, the `Updating For El Capitan' document linked there. While MacTeX-2015 installs the necessary link it is possible to create that link if you read Section 8 of that document. The most recent versions of the GUI applications supplied by MacTeX will (almost) auto-config to the change in link. I suspect many other apps (e.g., TeXmaker) have supplied updates that do the same. Not the answer you're looking for? Browse other questions tagged texmaker mactex or ask your own question.